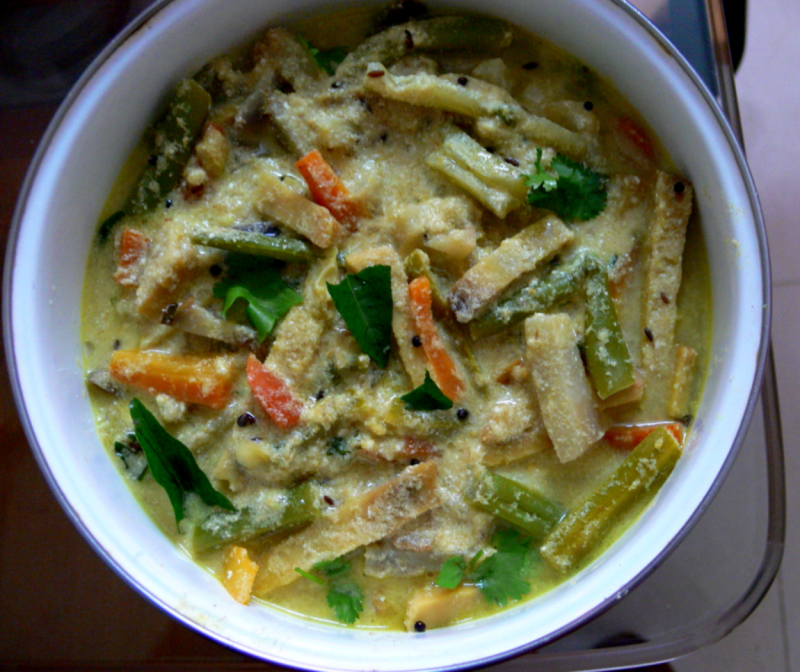 Avial is popular dish in Kerala and Tamil Nadu.This can be taken with Appams too. Cut the vegetables into bite size pieces and wash them well.Grind 2 tsp cumin seeds, 2 cups grated coconut,6 garlic cloves and 2 green chillies into a coarse paste. Take a microwave bowl, add 1/2 tsp mustard seeds,1/2 tsp cumin seeds,curry leaves and 1 tbsp coconut oil.Microwave this for 2 mins on high. Take the bowl out,add the vegetable pieces, salt, turmeric powder,ground coconut masala and 1 cup water and microwave this on high for 15 mins. Take the bowl out and add 100gm fresh curd and mix well. Sprinkle 1 tbsp coconut oil.Close the lid for 10 mins and then mix well. Serve this hot with Appams or rice and rasam or fish kuzhambu. Thankyou christy replying for the receipes, Actually i suggested whatevermade in chennai. It is fact. Then i am not a chef but much interested in cooking and suggests as per the taste. Anyway expecting urudai kuzhambu at the earliest. Mr.Padmanabhan,I think u have the Keralite Avial in ur mind(cause they only will add Yam,Clusterbeans,Pumpkin pieces etc.,).But omitting garlic and turmeric powder will make this dish taste better. Christy avoiding garlic is best. Then avoiding brinjal also. Instead adding red pumpkin, yam arbi,clusterbeans,white pumpkin and adding some more greenchillies it will be tasty. Avoiding haldi pdr it will be the best. Why because all the green vegetables it will show their own colour. U can leave garlic from being added to the coconut paste(if u don't like its taste) in step 1. This avial can be taken with Adai- another South Indian Speciality but add 1 cup coconutmilk more in the preparation.